Here's a new piece by Jim Kransberger callded Cat & Mouse(s) Game. The piece is 10.5" tall, 5.5" wide and 7" deep. Alternating mice pop up and down in the front corners, as the cat's head moves to follow them. The cat seems to not be able to be fast enough to get its head turned before the mouse retreats back into its hole and the other mouse appears. 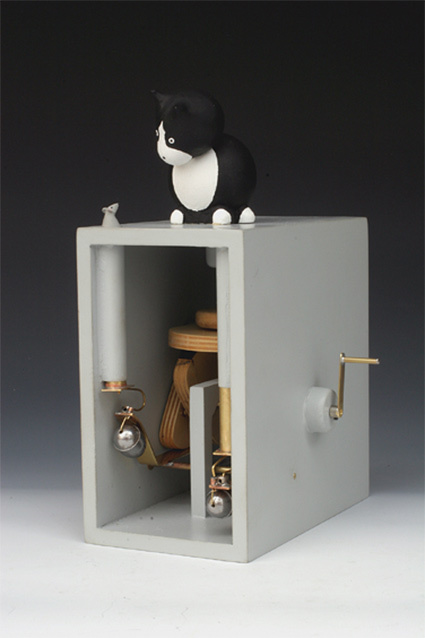 See more automata by Jim Kransberger on his web site.